In 2017, the exhibition Katarzyna Kobro and Władysław Strzemiński. Avant-garde Prototypes opened at the Museo Nacional Centro de Arte Reina Sofía in Madrid. It was the first monographic presentation of the works of these artists in a museum of this rank. The exhibition received very positive reviews from the Spanish art critics, it was visited by several hundred thousand viewers, and its aftermath has been the subsequent presentations of the achievements of Kobro and Strzemiński in other places in Europe. One of them is the Kobro & Strzemiński: Ny konst i turbulenta tider (Kobro & Strzemiński: New Art in Turbulent Times) – the exhibition prepared jointly with Moderna Museet Malmö in Sweden. The aim of the exhibition is first of all to present to the Swedish audience the achievements of the artists who played an important role in the art of the 20th century, who are known in this country only to a small circle of art connoisseurs. Therefore, to facilitate understanding of their work, the exhibition confronts it with more recognizable phenomena of the 20th century world art: Russian Avant-garde and Neo-plasticism. The purpose of presenting the works of the Russian Avant-garde artists is to create a context for the first phase of the work of those two Polish artists. Neo-plasticism, in turn, is shown as their permanent reference point from at least the 1920s. This was indeed one of the main sources of their inspiration, especially for the projects relating to architecture as well as applied art and space, the most important manifestation of which was the setting-up of the famous Neoplastic Room at the Muzeum Sztuki in Łódź. Both reference points were marked by the presentation of "a.r." works from the collection of Muzeum Sztuki in Łódź and the works from the Moderna Musset’s permanent collection. The exhibition includes over sixty works by Kobro and Strzemiński, as well as works by such artists as Piet Mondrian, Wladimir Tatlin, Aleksandr Rodchenko, Sophie Taeuber-Arp, Theo van Doesburg, Henryk Stażewski and Jean Hélion. The exhibition is divided into five parts. The first one is related to the beginnings of shaping of Kobro’s and Strzemiński's artistic character. The other three are devoted to unism and spatial compositions – in other words, to the original theoretical concepts of both artists, namely: typography and design. The last one represents the final stage of their creation, characterized by a return to the specific thing, human figure and corporeality, including the corporeality of vision - and a shift of interest from studying the structure and the way of organizing an artwork to the study of the structure of vision. 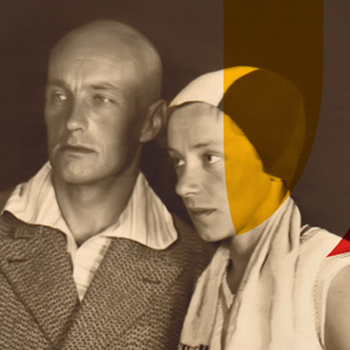 Moderna Museet has prepared a series of guided curatorial tours, lectures and seminars which are being presented over the duration of the exhibition and whose aim is to broaden the visitors' knowledge about the Polish creators of Modernism. The catalogue accompanying the exhibition has also been published, and contains, among other things, a rich photographic documentation of the exhibition. The exhibition has been organized by the Muzeum Sztuki in Łódź in co-operation with Moderna Museet and with the support of the Polish Institute in Stockholm and the Adam Mickiewicz Institute. The project is part of the international cultural programme - POLSKA 100 (Poland 100) - coordinated by the curators of Adam Mickiewicz Institute and implemented as part of the NIEPODLEGŁA (Sovereign Poland) Multiannual Programme for 2017-2021. It was financed from the funds of the Ministry of Culture and National Heritage under the NIEPODLEGŁA Multiannual Programme for the years 2017-2021.